Standalone GPS gadgets are getting more and more affordable. At the same time, there are a raft of new mobile devices that ship with sat nav capability as standard, including smartphones like Apple's iPhone, while Nokia offers free sat nav on Ovi Maps. With these all-in-one solutions so readily available, you may not realise that there are easy and very cheap ways to GPS-equip a PC or old PDA. For example, you can GPS-enable an old Windows Mobile handheld device using a Compact Flash or USB add-on for as little as £20. But what about maps? Like other media, maps are subject to copyright and can be expensive to get hold of. Most of the online services that provide them don't include facilities to save maps for offline use, either. So, to acquire maps you need one of two things: a lot of disposable income, or a bit of cunning. We'll be exploring the latter option and describing ways to get free for GPS use from online sources legally. The standard Google Maps service doesn't make it easy to save maps for offline use. Nor does the Maps application for mobile use – but it does cache map imagery when you're online. You can use this to your advantage if you have a device like a mobile phone or PDA with GPS access. It's as easy as this: before you set off, map a route using the Google Maps application on your device. Now zoom into a readable level and scroll through the route. Unfortunately, this is all a bit ad-hoc. Google doesn't publish details on its cache size, though we've seen users reporting that 'cache-GLM.dat' – the file containing the tiles – can grow to 40MB. That's sufficient for saving a short route or a street-level city plan for use on the move. An alternative to Google Maps that includes an export feature is OpenStreetMap. These community-created maps are free to download in a variety of formats, or you can use them like Google Maps online. The export dialog enables you to output maps in OSM's own XML format, as Mapnik bitmap images tiles or as an Osmarender SVG format image (a vector file). You can also create your own standalone embedded HTML maps for inclusion on websites. The OpenStreetMap format can be converted for use with most Garmin GPS devices. There's a more comprehensive guide at the OpenStreetMap Wiki, which features a list of supported units. You'll need to export your map in OSM format, then convert that XML data into a Garmin-supported MP file. GroundTruth is a command-line application that converts OSM files. Entering the command groundtruth makemap (with appropriate parameters) creates Garmin readable maps from OSM XML sources. The same command with the parameter -upload transfers a converted map to a connected device. You'll need to have the free tool SendMap too. This is available from to download from here. Next, let's sort out a Windows PC. MapSphere is a great way to use Yahoo Maps, OSM and, using an extension, Google Maps – with GPS support on any machine. That's not strictly what it was made for, though: MapSphere was developed as a way of sharing 'tracks' – GPS trails around areas – and sending real-time GPS data to the web. But of the free software available, it provides one of the best methods for backing up map data and using it in different contexts. Download the software from here. 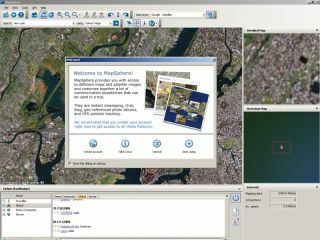 You'll be prompted to create a MapSphere account when you first log in. This will be used to upload and share your GPS coordinates and tracks with other MapSphere users. There's no need to worry about stalkers – you can set your data to be public or privately viewable.